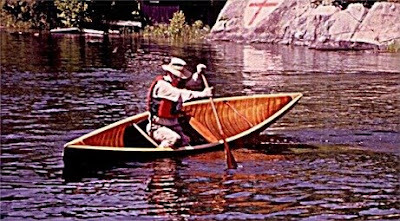 I've just ordered plans for my next boat: an Èlan solo freestyle canoe by Doug Ingram of Red River Canoe & Paddle. Doug builds gorgeous traditional cedar-and-canvas canoes, including this one, and also does some designs, and the Èlan, he says, also works well for strip-building. I'm by no means a freestyle paddler, but I have a hankering to learn, and since boats well suited to freestyle aren't all that readily available, building one seems to be a good approach. Strip-building, also known as strip planking, is a boatbuilding method that edge-joins narrow strips of wood to form the hull. It differs from carvel planking primarily in that strips are much narrower. It was originally applied as an economical alternative to the cost of full-width planks when building "full size" boats (like lobster boats), and in such applications, the strips would often be as thick as carvel planks and could be edge-nailed together with glue in between. (Careful, I'm distinguishing between width and thickness here.) But as applied to modern canoe and kayak designs, the strips are very thin -- typically 3/16" or 1/4" -- that's too thin to edge-nail, so the strips are simply glued edge to edge. The hulls is shaped over temporary forms, then covered inside and outside with fiberglass, carbon fiber, or Kevlar fabric laid in epoxy. This makes the structure so stiff that no internal hull structure (keel, frames, bulkheads) is needed -- although canoes, of course, have thwarts, and kayaks decks, which add considerable stiffness. The result is both tough and lightweight, and the method lends itself to round hulls with fair curves -- unlike the stitch-and-glue method of boatbuilding, which can only produce chined hulls. There are several books on strip-building, links to some of which I'm inserting below. Nick Schade, who wrote The Strip-Built Sea Kayak, has a new book on strip building coming out soon with McGraw-Hill: Building Strip Planked Boats. Where his previous book covered only kayaks, the new one addresses other types, including open canoes and rowing boats. Nick is the proprietor of Guillemot Kayaks, and he is a craftsman of extraordinary talent – meticulous in his designs, woodworking, and writing. According to an article in the Peterborough Examiner, Jeremy Ward, the new curator of the Canadian Canoe Museum, in Peterborough, ON, is taking steps to involve the museum more closely with the local community. The article tells of a project that Ward managed for the museum, the "construction of a 36-inch birchbark canoe in 2004." On first reading this, I thought that the reporter or editor had misread the foot (') mark and interpreted it as inches (") -- shades of the funniest scene in the movie "This is Spinal Tap!" But on further reading, it turned out to be accurate -- there is a current exhibit of miniature canoes that Ward managed. I've never had a chance to visit, but the CCM is at the top of my list of places to go -- up there with India and northern Scotland. They don't have a terribly impressive website, but the scope of their collection of canoes from around the world is renowned. Maybe in gratitude for this tremendously valuable exposure, Mr. Ward will sponsor an all-expenses-paid trip for me and my family. You suppose? Life boats were stationed at dangerous rapids & it is recorded that in 1899 they were instrumental in saving 1473 lives from wrecked junks. Salvaging of cargo was expressly forbidden. The boat shown is about 20 feet long & 7 feet wide. In 1901 there were 44 of these boats. Later larger boats were introduced. Inscription on stern flag reads: "The Society for Rescuing Drowning People, Lower Section, Lungmenhao, South Bank, Chungking." It's intriguing to picture this boat in use in was must have been (given the numbers of rescues performed) really dangerous whitewater, with men standing, facing forward, at the two rowing oars, and another at the enormous steering oar. I presume the steeing oar had a propulsive function as well.